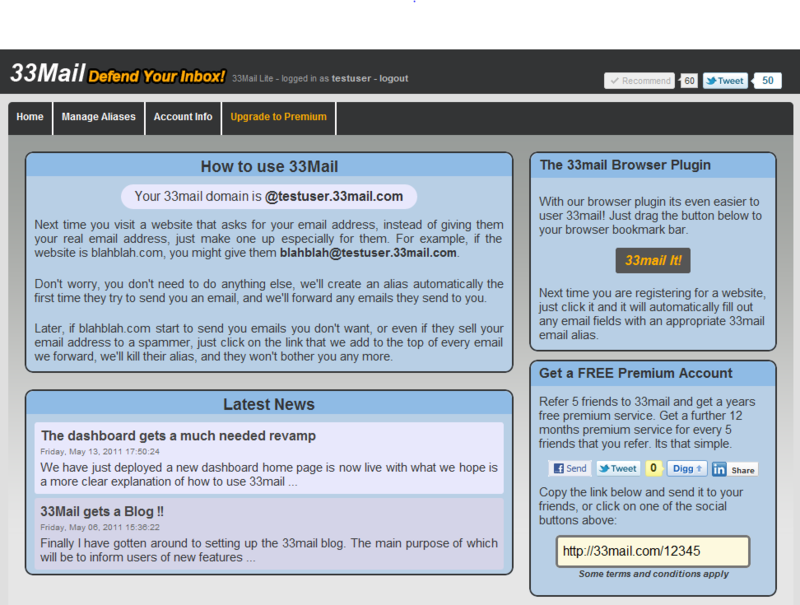 We have just released the initial version of the 33Mail Chrome extension here. The main purpose of this extension is to make creating a 33mail alias as simple as possible. Whenever you visit a site and the extension detects an email address signup field it will automatically fill in an appropriate 33mail alias saving you the trouble of doing all that typing. You can also choose to have it not auto-fill the email address fields and rather only fill it when you click on the handy button in your browser bar. We already find the extension very useful and hope that our users do too. We would love to hear your feedback and feature requests for the extension so leave a comment here or on the extension page here. This entry was posted in Uncategorized on July 15, 2011 by andrew. Get free premium by inviting only *2* friends! Based on conversations with our users, we’ve decided to drop the number of referrals required for a free year of our Premium service from 5 to just 2! All you need to do is to make sure that your friends sign up using your referral link, which you can find at the bottom-right of your dashboard page. So what are you waiting for?! Time to start evangelizing! This entry was posted in New Features on June 23, 2011 by ian. We have just deployed a new dashboard home page is now live with what we hope is a clearer explanation of how to use 33mail along with some css3 rounded corner goodness (note that Internet Explorer users will be stuck with square corners until Microsoft gets its act together). We hope to deploy further widgets to the dashboard page in future to give at a glance useful information such as bandwidth usage and most used aliases. Any feedback on the new layout, good or bad would be much appreciated. This entry was posted in New Features on May 13, 2011 by andrew. 33Mail gets a Blog !! Finally I have gotten around to setting up the 33mail blog. The main purpose of which will be to inform users of new features and to keep everyone informed about the 33mail service in general. I will of course also use it to rant about various things that come into my head once in a while. This entry was posted in Misc on May 6, 2011 by andrew.